What we have here is an Oscar frontrunner, at least where the hive mind is concerned. The reactions out of Venice were good – mostly good – but the reactions out of Toronto are even better, with many saying it’s the “real deal,” meaning, not just hype but an actual good, entertaining, effective movie. Every so often a negative tweet comes through but clearly this is a movie almost every one liked. For now, it will go into the frontrunner spot, with First Man and Roma breathing a sigh of relief not to be out there for harpooning. Richard Lawson flat out calls Bradley Cooper for the win for Best Actor (though it’s not easy to win Best Actor when you direct yourself – Roberto Benigni did it with Life is Beautiful. Lawrence Olivier did it with Hamlet. Can Bradley Cooper do it with A Star is Born? A Star Is Born is phenomenal. A trenchant critique of the modern pop machinery, and also a beautiful portrait of Lady Gaga and Bradley Cooper adopting a dog. 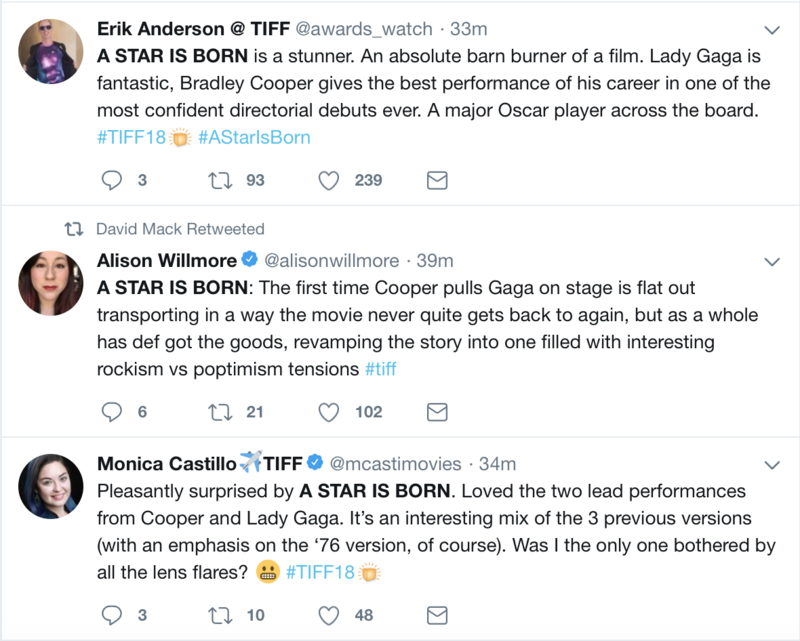 A STAR IS BORN: oh no… it’s fantastic. I could not have been more skeptical, and yet this worked on me real, real good. Lady Gaga is [insert hyperbole of choice]. It’s gonna be fun knowing “A Star Is Born” is undeniable and watching it win over skeptics one by one this season. I was one of them. Could not have gone in with more of a “show me” attitude. There’s no way Cooper isn’t winning best actor?